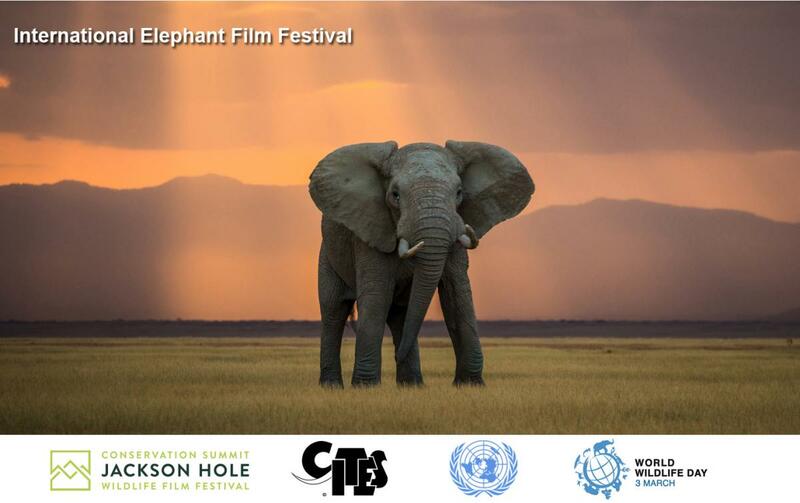 Geneva/Jackson, WY, 18 November 2015 - The Jackson Hole Wildlife Film Festival and the Secretariat of the Convention on International Trade in Endangered Species of Wild Flora and Fauna (CITES) have teamed up in organizing an International Elephant Film Festival to raise global awareness of the various challenges facing the African and Asian elephants, and to mark next year’s UN World Wildlife Day (3 March 2016). As the largest and most magnificent terrestrial animal on our planet, the elephant once roamed through much of Africa and Asia. Over the past decade, devastating poaching of African elephants for their ivory is reducing their overall numbers, and has decimated some African elephant populations. Over the period 2010-2012, an estimated 100,000 elephants were poached for their ivory, which is a devastating figure. Industrial-scale poaching to feed the illicit ivory trade is among the most noticeable and destructive forms of wildlife crime. In response, there has been increasing high level political support to combat these crimes as was recently demonstrated through the adoption of the historic United Nations General Assembly Resolution on tackling illicit wildlife trade. “The great political momentum that has been generated over the past few years to combat illicit wildlife trafficking is translating into deeper and stronger efforts to fight these highly destructive crimes on the front lines, where is it most needed. It is through collective action that we will win this fight, which will be a feature of The Festival”, added Scanlon. The CITES Secretariat is designated by the United Nations General Assembly as the global facilitator for the celebration of the World Wildlife Day each year in collaboration with organizations in the United Nations system. The CITES Secretariat will continue to work with UNDP, UNODC, UNEP and others as active partners to mobilize the worldwide celebration of the day in 2016. The call for entries will close on 15 January, 2016 and finalists will be announced in early February. Winners will be presented at a high level event to coincide with the global celebration of UN World Wildlife Day at UN Headquarters in New York on 3 March 2016. Winning and finalist films will be subsequently showcased extensively throughout the world, with specifically targeted countries and regions including African countries, China, Philippines, Thailand, the United States of America and Viet Nam, through screening events and local broadcast stations. Subtitled DVDs will be distributed free to schools and libraries, and free screenings will be organized with local NGOs and elephant stakeholders wishing to incorporate Elephant Film Festival finalists and winners into their own programming. MicroMovie/Short Programme (under 5 minutes). Programmes created since 1 January, 2007 are eligible for consideration. Entries must have been completed after 1 January, 2007 but need not have been broadcast/exhibited prior to submission. Media submitted may be of any length, may originate in any format (including animation, web page, etc.) and be fictional or non-fictional. Motion picture programmes must have mixed (mono/stereo) audio track on both channels, must be an English version (dubbed or subtitled), and programmes with visible time-code will not be accepted. Submissions in all official UN languages (Arabic, Chinese, English, French, Russian, and Spanish) and Swahili, are welcomed. Programmes in a language other than English must be subtitled in English for Festival presentation. Jackson Hole Wildlife Film Festival’s (JHWFF’s) programs promote public awareness and stewardship of wildlife and wildlife habitat through the innovative use of media.. Since 1991, its annual conferences draw together international leaders in science, conservation, broadcasting and media,. For three days this year, committed elephant advocates convened for the Jackson Hole Conservation Summit: Elephants (Sept. 27-29), to share resources and strategies, address critical challenges and brainstorm innovative approaches for collaboration. They joined 650+ of the world’s most influential filmmakers and commissioners at the Jackson Hole Wildlife Film Festival to celebrate the world’s finest nature programming and explore innovative ways to integrate media centrally into the battle against global wildlife crime.